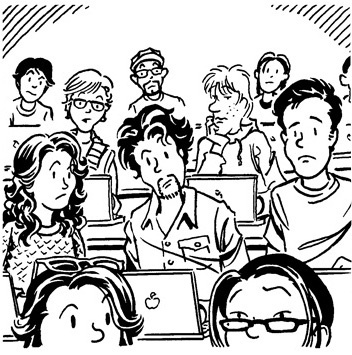 I got a kick out of drawing today’s Sally Forth strip (4/5/2013) as I’ve had “those moments” as a teacher – where you’re completely NOT connecting with the students. The writer, Francesco Marciuliano, hit the nail on the head with this one. As such, I couldn’t help but populate the second panel with a bunch of students from where I’ve most recently taught – the Minneapolis College of Art and Design. Caitlin Skaalrud and Amaya Goldsmith. Mandie Brasington, Jack Kotz and Jay Rasgorshek. Jaime Willems and actual character from the strip. April Kasulis, Ben Tye, Lindsey Hall and Mr. Croptoff. As I mostly taught Comic Art at MCAD (what other kind of art is there?) I’m including a link to the MCAD Comic Art Tumblr so you can see some of the incredible work they’ve been up to. This entry was posted in Francesco Marciuliano, Sally Forth and tagged MCAD, Sally Forth. Bookmark the permalink. King Features owns my copyright, too. It’s a rocky road. Did you say “rocky road”? It’s off to Dublin!